Avid fly fishermen will find no shortage of opportunities in Grand Cayman. Flats, backwaters, and canals are home to some of this sport’s most prestigious species, including Bonefish, Tarpon, and Permit — the iconic “grand slam.” You can enjoy fly fishing Grand Cayman anytime of year, on the water and on shore. Bonefish is perhaps the best species to target on fly in Grand Cayman. Fishing the flats for this coveted catch is excellent, especially in spring and fall. 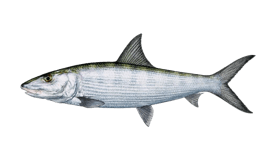 Bonefish here tend to reach an average of 3-5 lbs (sometimes 8 or 9 lbs!) and they are not as easily spooked as you might think. 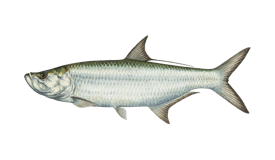 Tarpon is also prevalent, with many juveniles in the 2-15 lbs range swimming in the island’s canals and backwaters. Late summer is generally the best time to target Tarpon, along with Snook. Your chances of catching Barracuda and Jacks are excellent year-round. You can catch Triggerfish and Mutton Snapper on fly, as well. The best time to target Snapper inshore is in winter and spring. 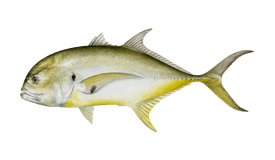 Permit have been overfished in Grand Cayman and are not as prevalent as they used to be. However, you may still have luck fishing for them in spring and summer. You can hope to catch Permit as a pleasant surprise rather than a sure bet. There are many different ways to go about fly fishing Grand Cayman. Fishing the flats by boat usually requires a skiff, but you can also access these waters easily by foot. Over 30 miles of shoreline flats and the island’s famous Seven Mile Beach provide ample opportunity to cast lines from land. 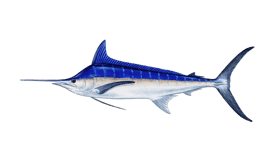 Some Grand Cayman fishing charters include guided wade fishing or shore fishing. If you do not plan to fish by boat, renting a car is recommended so you can move about the island easily when you are ready to try a new spot. Some places locals recommend are Prospect Point, East End, West Bay, North Coast, Frank Sound, Rum Point, and Cayman Kai. Anglers usually need to provide their own gear when fly fishing in Grand Cayman. Fly fishing for Bonefish in Grand Cayman calls for lightly weighted flies and long leaders that turn over gently. Standard Bonefish flies are too heavy and will get lost in the thick grass blanketing the flats. Implementing weed guards is also crucial. You can target Bonefish on the flats when the tide floods the shallows and these fish move inshore to feed. This presents the opportune moment for a gentle, accurate cast, which should land directly in front of the fish. Juvenile Tarpon in the canals and backwaters of Grand Cayman are also very receptive to fly fishing. Chugging a popper or bass-bug along the surface is very likely to get their attention. These fish are hard-fighting, so a bite tippet of about one foot (or more) of 25 lb fluorocarbon is recommended. While targeting Barracuda, using a wire bite-tippet is recommended, or else you can end up losing a lot of lures. Long tube-flies with a stinger hook on a 10-weight will help you land this tough fighter on fly. Some consider a Cuda-Tube (orange or green) to be the weapon of choice. On the other hand, you can target Jacks using virtually any lure or fly, so long as you choose something flashy and implement a quick retrieval.